One more council time update while I'm at it. January was a bit of a slow month as everything seems to take a bit of time to get rolling in the new year. Check out Sept of 2009 here and all posts on the subject here. The standard council time disclaimer: I'm not including; time spent reading agendas, doing research, travelling to and from meetings or answering resident's phone calls & emails. Those add up too but again they are really tough to measure. So, if you think I might be overstating how much time something took or that the amount of time spent isn't really all that onerous please keep these "unmeasureables" in mind - they add up and this probably understates the time that one needs to commit to council. It's been a while since my last post looking at how much time being an alderman actually requires. 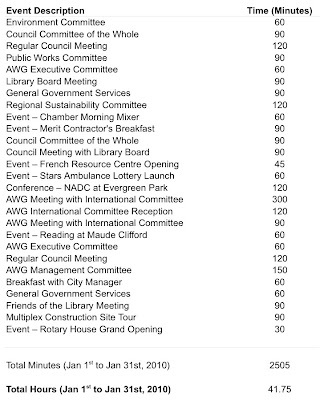 (See all previous posts HERE) I was reminded to take a look again when the committee looking at council pay made a request looking for info. 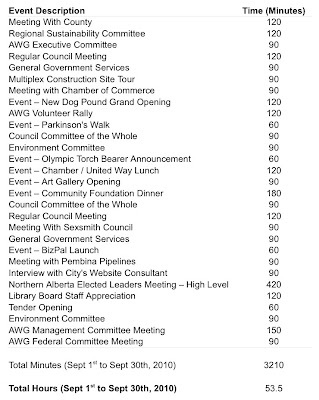 They want to know how much time council members commit to the various committee and events as part of the job. I passed on the link to my previous posts but also did up two new time charts that are a little more recent. So, here's the first of those two new council time updates, my time in meetings and events from September 1st to 30th, 2009. As I say every time; please take this only as a rough estimate of time spent on things that I have physically attended. Also, I'm not including; time spent reading agendas, doing research, travelling to and from meetings or answering resident's phone calls & emails. Those add up too but again they are really tough to measure. For example a meeting might last for an hour but what would you suggest getting there and back to home (where I work) adds? I'm not sure, I try to be early for meetings so that's another 10 minutes and I probably leave home another 10 minutes before that. It probably takes another 10 to get back home afterwards so a 1 hour meeting probably takes more like 1.5 hours out of my day. What do you think? While I was away the news that the city is purchasing the dilapidated York Hotel became public. I strongly believe that this is the right move for the future of not just down town but, the community as a whole really. It's been an eyesore for a long time and it's really impacted people's sense of how safe our community it. We've been working on the purchase for a long time behind the scenes and I'm happy that it's now out in the public domain so we can finally discuss it with the community. Of course the process isn't going to be without it's surprises as we actually take on ownership of the building. But I think, working together, we can build a solution that improves the safety of our community, reinvigorates downtown and helps some people who were being taken advantage of. Hmmmm, I just re-read that last sentence and I suppose it might be unclear who I mean when I say "working together". Of course I mean the city (Council and staff) but I also mean community agencies who are involved in housing, addictions and social services. Those two are probably obvious and you might have guess them. In addition to those two groups, I also mean the downtown business community (they've got a lot invested in the success of the area and have been on the front lines of the issues created by the building over the past number of years) AND .... you. Now that we can influence what happens with this property it's time that we had a community-wide discussion about where we go next and how we get there and you, the general public should have a say. I'm looking for your feedback - get involved, tell me what you'd like to see happen with the York. Do you have ideas for the property? Concerns about the residents or businesses? The City of Grande Prairie is taking steps to assume possession of the York Hotel on March 4 should there be no challenge during the appeal process. A preliminary assessment of the building, to the best of our ability, was carried out and has identified safety concerns that may need to be addressed immediately to ensure the safety of the tenants. Efforts are underway to assist residents and lessees with the transition once the City is able to take ownership of the premises. There are approximately 24 tenants in the hotel along with the Safari Restaurant and the Lucky Convenience Store. The City’s plan for assisting residents includes providing Community Housing workers to assist in the transition. The City will also help with locating tenants to a new home, payment of first month’s rent and security deposit, assistance with moving and short-term storage of belongings, as necessary, and help with accessing additional resources, if needed. “We are committed to ensuring the people living at the York Hotel find suitable accommodations so they can effectively transition into the community and move forward with their lives,” says Deputy Mayor Gladys Blackmore. A Court of Queen’s Bench judge ruled on Feb. 3 that the City of Grande Prairie’s bid of $1.1 million was successful in a foreclosure hearing. The York Hotel, located at 10012-101 Street was built in 1948. “By purchasing this property, Council has positioned the City to guide development in that section of Grande Prairie in the long-term interest of the community,” Blackmore says.